It may be fall according to the calendar but it still feels like summer here. That’s ok though, because I’m in full fall mode decorating the house. 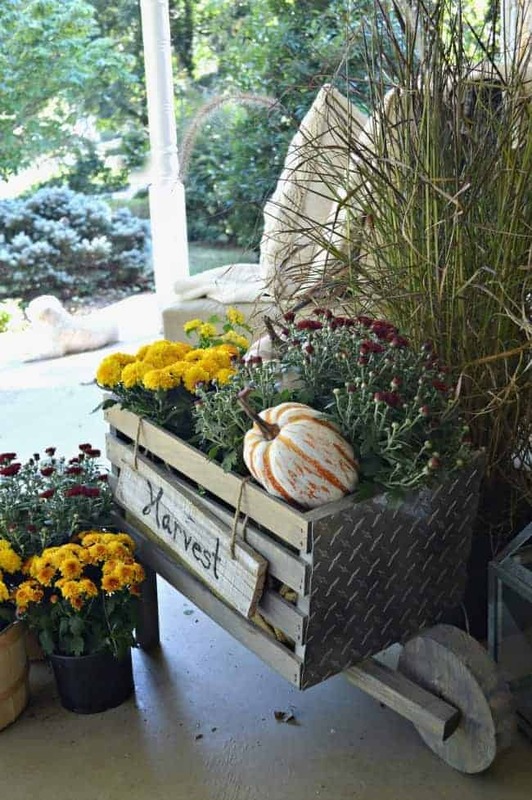 I shared the rustic wheelbarrow that I made for my fall front porch last week, but didn’t show you the whole porch, so I thought we’d take a look today and I’d share a little bit of the house history. Our house is a one level, stone cottage and it was built in 1946 (you can read the strange but true story about how we found her, here). The original structure is stone, from the basement to chimney, and is solidly built with super thick walls. There was a small room added onto the back of the house about 15 years ago that is stick-built with siding. From some of the info we’ve gathered from our new neighbors, the porch and roof are both original to the house, although the posts don’t look original. We are going to have to do some work on it in the near future to fix all of rotted wood, but we love that we have a covered space. Our last house, in Illinois, only had a teeny, tiny uncovered stoop. Decorating it was a real challenge because I could only fit a few pumpkins and mums, but this house has a nice covered porch that I can dress up and have fun with. I really had to restrain myself when it came to decor because it could have quickly gotten out of hand. All I added was a few faux pumpkins, some mums, a purple fountain grass and a couple of lanterns, from The Home Depot. 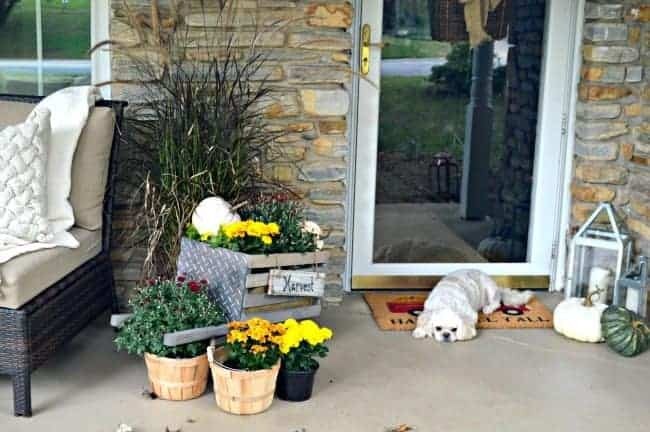 The fall front door basket is a DIY from our last house (you can check out the easy tutorial, here) and it’s so big that I had to hang it on the storm door. Luckily, the porch is covered so it doesn’t have to sit out in the rain. *This post contains an affiliate link. Please see my Privacy Page for more info. This is one of our favorite spots to hang out and talk about our day after we’ve had dinner. 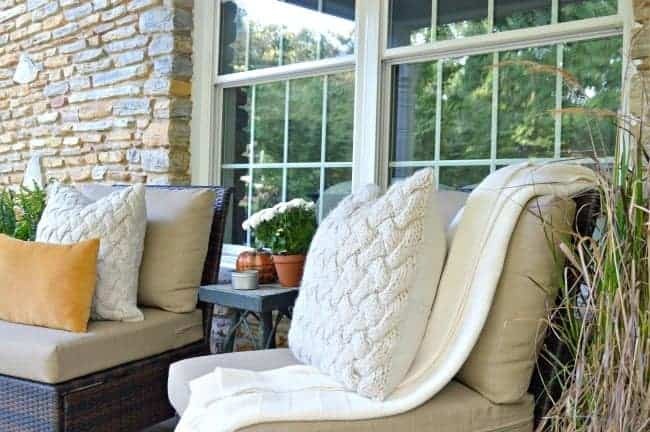 The chairs are from Wayfair (*affiliate link) and the cream pillow covers are from H&M. Of course we already have plans for this space. A lot of the wood and the posts are rotting out, and it will all have to be taken care of sooner rather than later. The hubs would also like to extend the roof and porch down to the guest bedroom, but the front of the house doesn’t get a lot of sun and it would make the bedroom dark. That is no bueno. For now though, it’s enough to keep us dry and we are truly enjoying it. So much is going on inside the house too, and the rooms are coming together. We’ve got a long way to go but I’m excited to share how far it’s come. I also need to fill you in on the DIY garden cabinet I did for the front porch. 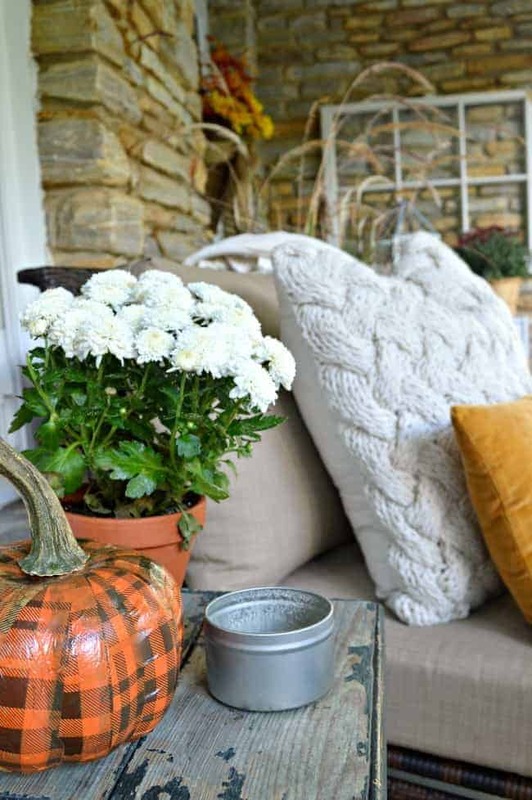 I love the porch decorations, especially the plaid pumpkin. It looks so warm and welcoming. 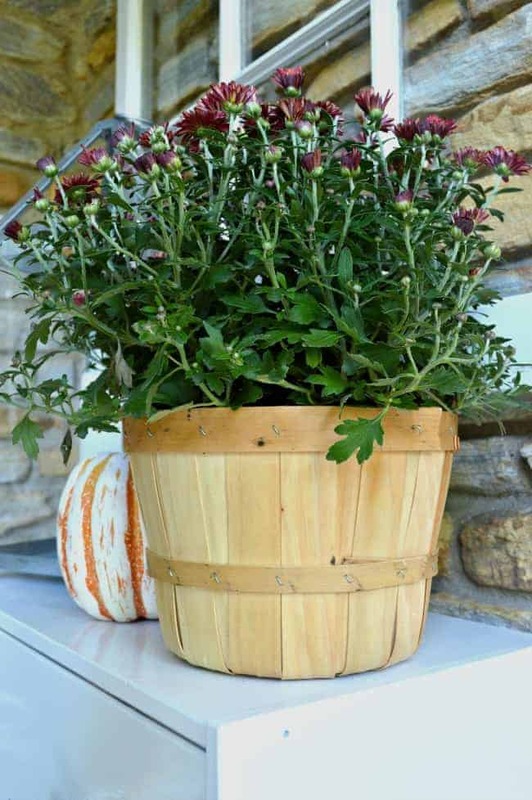 Love your fall porch Kristi! It looks so warm and inviting and that wheelbarrow is too cute! 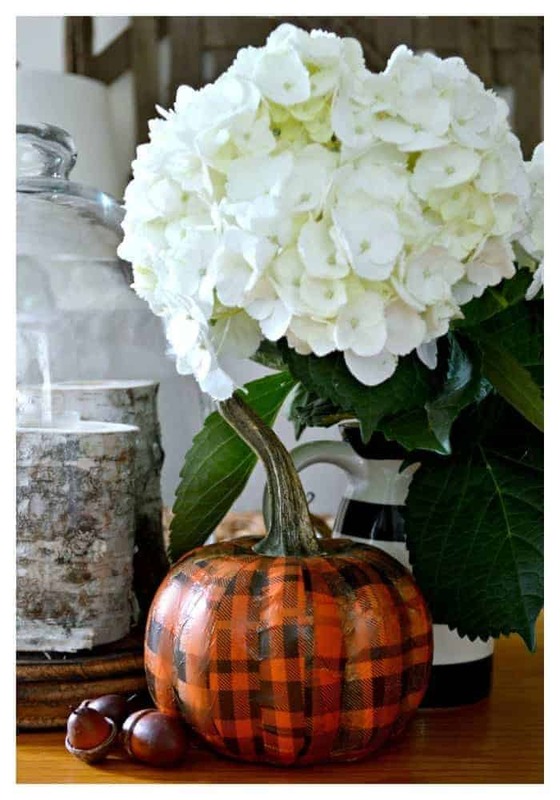 I am just crazy over the plaid pumpkin. What a great idea and I look forward to going back and reading the post about how to make them. 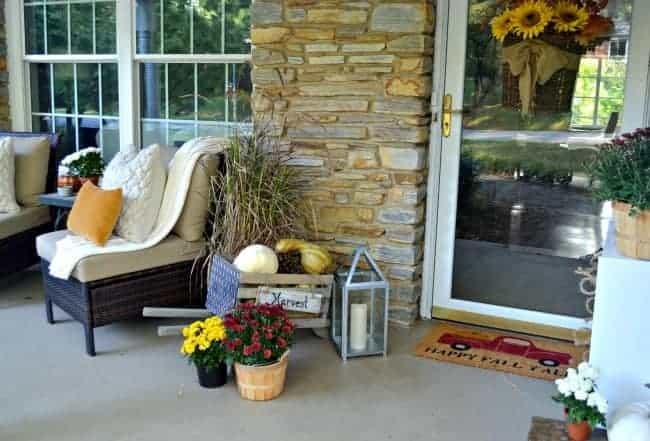 Your porch looks great and very welcoming. Take Care ! I think Christmas of 2017 is a good date to have the front door done!!! 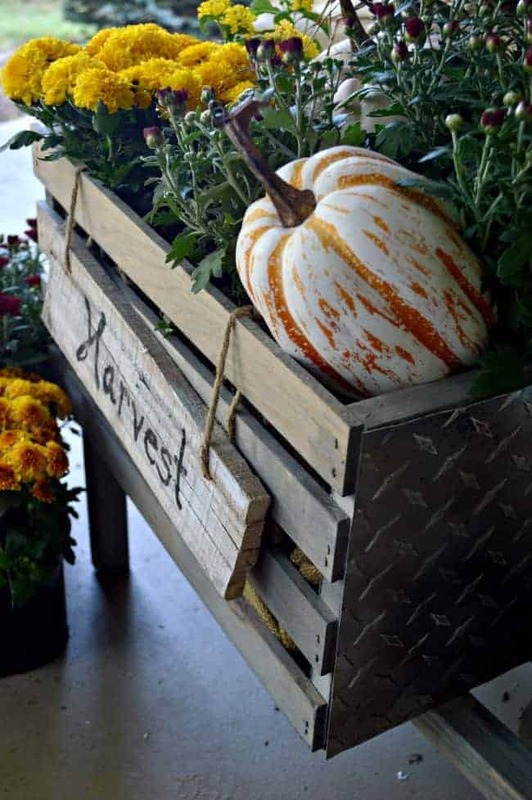 Your decoration is Fall -perfect, but the best part of it all, you seem to have lived here forever! Amazing! 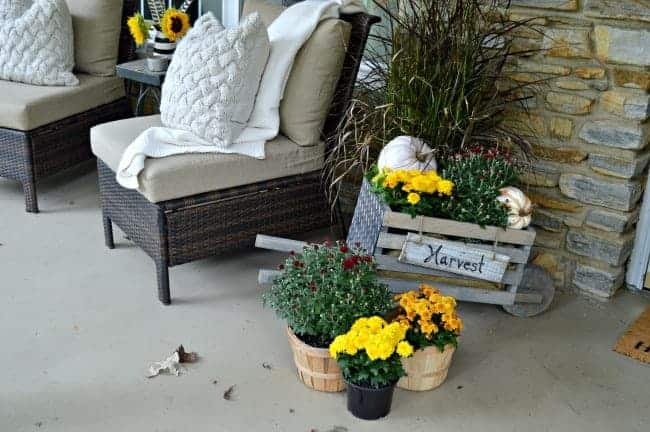 Wow, you did a good job decorating the porch. Thanks for sharing.? Thanks so much Rhonda. We really love the space. 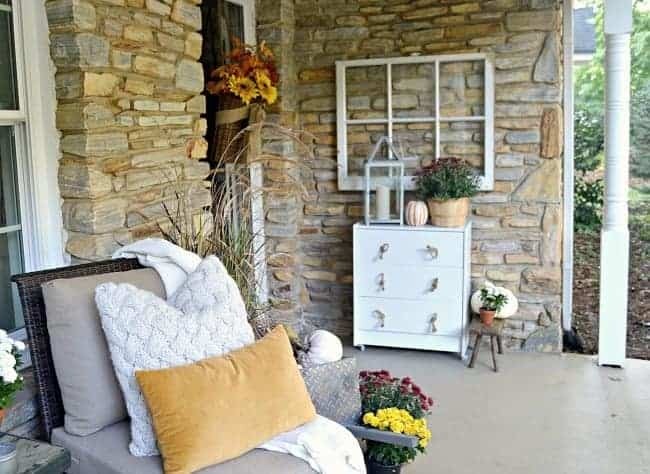 Kristie: The porch looks so pretty and relaxing. Apparently your little dog thinks so too! 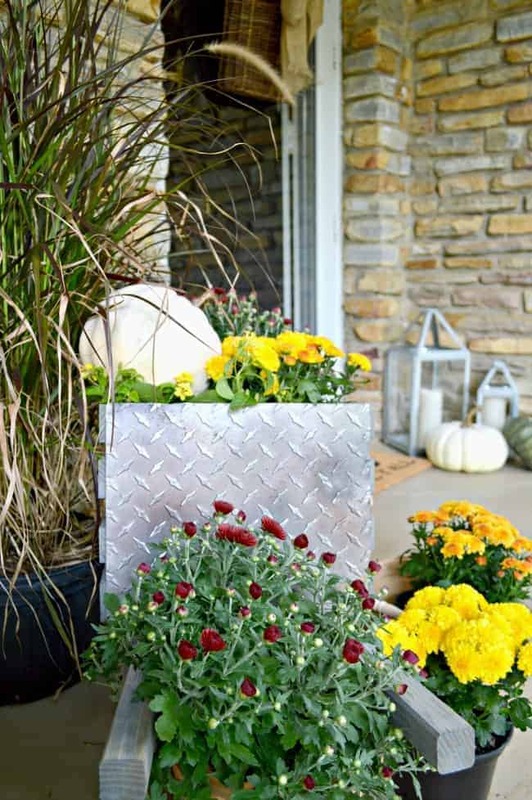 Kristi, your fall porch looks fabulous. 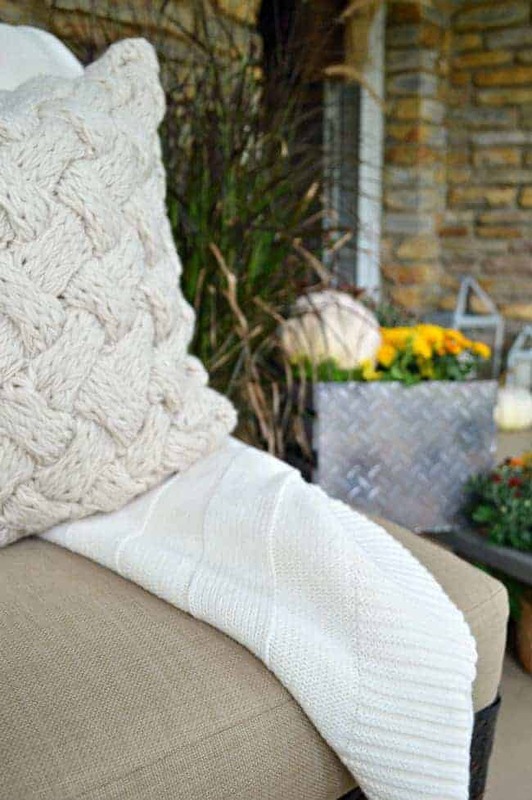 Love the seating and all the layers! Thanks so much, Kim. It’s our favorite place to be, especially with the weather cooling off.